Last year, I took an online class on drawing techniques that covered the basics. I found that I enjoy creating more than just stick people. 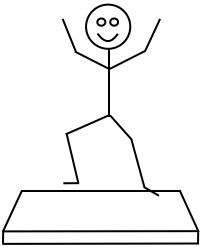 The skinny characters served me well illustrating physics situations in the classroom. But, I was ready for more. As I progress and draw other things, they will be put in a separate blog for easy access. It will serve as my digital portfolio. If you are interesting in keeping track, go there and click follow. You’ll get the updates as they occur. I will be happy to see you. Comments and critiques are welcome. I think we all find creativity captivating. We see it happening and open our minds to gather it in. It inspires us. It motivates us. We act in new ways. It is an essential element of humanity. Each of us has different ways of expressing our creativity. We write, sing, play music, speak, teach, paint, sculpt, lead, mentor, parent, etc, in various creative ways as part of our daily lives. Children are especially good at creative play. I get to see it happen when Melanie works on a quilt project. Each of the hundreds she has made involved an evolution of ideas, fabrics, and methods. Many started with the seed of an idea from a book or article. Some started on a piece of scrap paper across from me at the breakfast table. Some design got sketched out and saved for a long time as the idea jelled in her head. Later, pieces of fabric are arranged by colors and patterns on the floor of the living room or her workspace downstairs. Once in a while, I am asked for a ‘consultation’ about design or color. Funny, I am somewhat color blind. Eventually, cutting and piecing and sewing begins. It grows into a fully formed quilt top ready to be sandwiched with batting and a back. It is loaded on the long-arm machine and quilted. Binding is sewn around the edges to finish the work of art. I get to help with one of the final steps, that of photographing it. Recently, Melanie finished a special quilt. We hung it to set the lighting for a good photograph. I fiddled with the camera settings. When I looked up, I saw this. She was carefully looking it over for loose threads or bad stitches. I quietly stole the shot without saying much. For me, it was a moving scene. She had put much effort and love into the process of creating. It is a joy to watch it happen. My camera has a long zoom ideal for images of the Sun and Moon. To see sunspots or solar eclipse details requires a safe solar filter. They can be costly. What to do? I have several free pair of eclipse viewing solar filter glasses. They are made of thin cardboard like some of these. Safe filters are located where a glass lens would normally be placed. How could I attach one of those to the front of my camera lens and safely image the Sun? I looked around and pondered the solution. When I tossed something into the trash under the sink, it dawned on me. The empty orange juice can in the trash might work. I slipped it over the end of the camera lens. It was a perfect snug fit. Using shears, I cut an opening in the metal end of the can big enough to allow half of one of the eclipse glasses to be fitted over it. Duct tape did the rest. I love duct tape. I now have a safe and secure solar filter. Rabbits worship this kind of thing. Many techniques are used in preparing food. Some are tried and true methods passed down through the ages. I’ve come up with a few of my own that are more unusual. I made the following short videos to illustrate them. I hope you try them and find them useful. These can be challenging because of their size, texture, and different parts. I use a serrated bread knife. Be careful. Mom and Dad knew I liked science and astronomy. 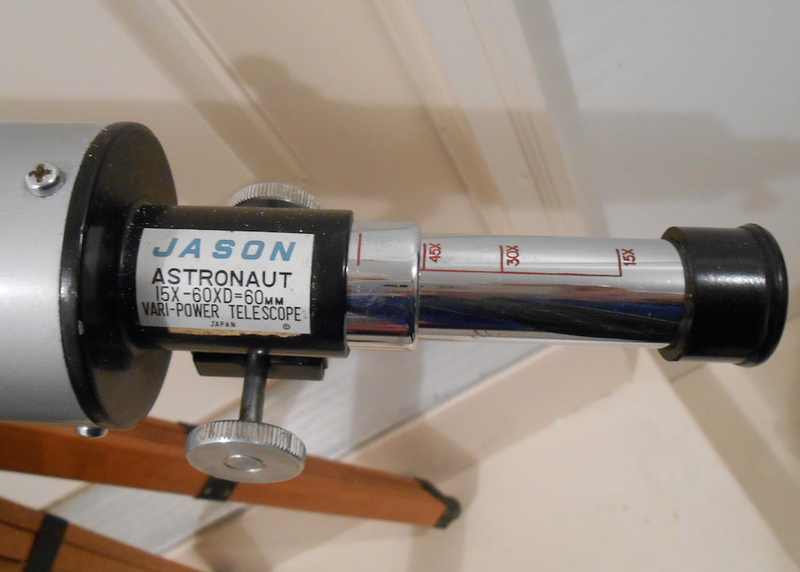 They gave me a telescope in the early 1960s as I finished junior high school. Years before they got me a microscope to view the tiny world of inner space. This gift allowed me to see the world of outer space. I loved that telescope. 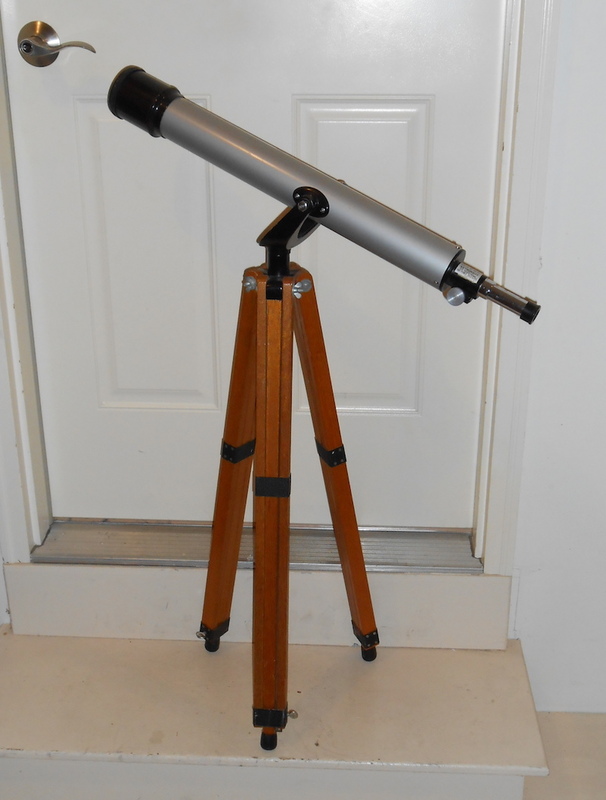 I went to the garage cabinet the other day and got out that old telescope and tripod. It’s an old friend. Together, we have viewed the rings of Saturn, the moons of Jupiter, Earth’s Moon, comets, the Orion nebula, and much more. I have a bigger and better telescope now. But, this one is special. Recently, I read the opinion piece at the end of the February 2016 Sky & Telescope magazine. It was written by Dean Regas and entitled Saturn Changes You. Dean is the outreach astronomer at the Cincinnati Observatory and co-host of the nationally syndicated program Star Gazers. He described the sense of awe and inspiration he felt at seeing Saturn for the first time through a telescope. It was a moving and powerful experience for him. My wife Melanie, our grandkids, and many others, marveled at seeing Saturn for the first time through my telescopes. It is a thrill to see the small sphere with those outstretched rings. Something about it changes your worldview as Regas said in his article. Thank you for the email and I’m so happy that the article took you back to that first views (and that old telescope). That was my intention and I’m hoping we can share those experiences with the next generation. It’s almost Saturn season! My first view of Saturn looked like this. It was tiny, just big enough to make out the gap between the rings and the planet sphere. My view was probably not quite this sharp or clear. But, I didn’t care. I saw Saturn! It became my favorite planet. Recently, I noticed a news story about a youngster aged 15 who also saw Saturn through his telescope. Marcus Reed of Seaford, East Sussex, England looked through his telescope, about twice the size of mine. Plus, Marcus had a tool I didn’t have available 55 years ago. He put his cell phone to the eyepiece and captured this beautiful large image of Saturn. 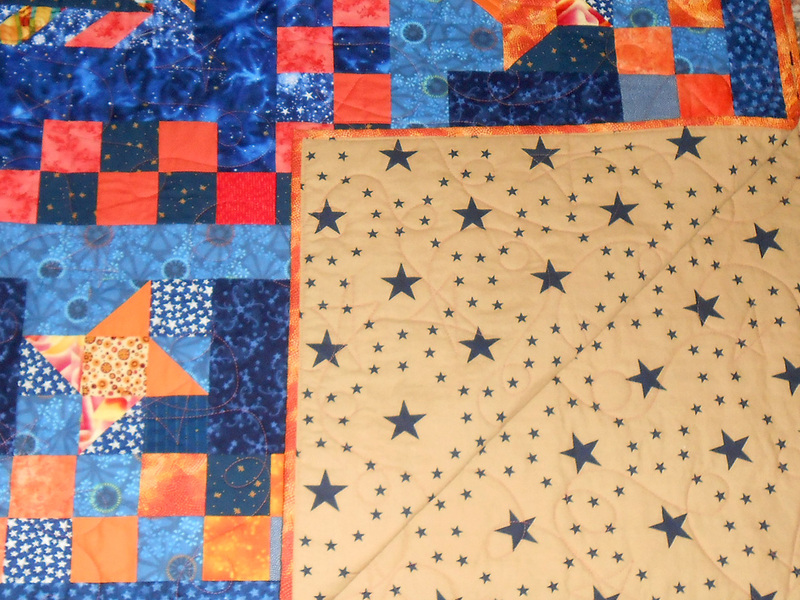 Melanie and I are happy to announce the recipient of the Oh My Stars donation quilt. The story and monetary offer combined to make a compelling case that it should go to this person. She will be known as Grace in order to maintain her privacy. Here are details of the donation quilt offer in case you missed the earlier post. Grace has been a volunteer with her local hospice center after they cared for her mother and father. She has assisted patients and their families as they transitioned through the hospice process. Grace knows first-hand the wonderful help they give to others in their hours of great need. She has chosen to donate her offering to Iowa City Hospice. Melanie and I visited the office of Iowa City Hospice. We brought the quilt and Grace’s donation. We explained the circumstances of the quilt project that led to her donation. They were moved by Grace’s story and grateful for her donation. Now Grace needs that same hospice care. She has been diagnosed with cancer which has metastasized. Previous surgery complications and resultant problems left her with difficult choices of what to do next during her remaining months. She has decided to forego more surgery and instead receive care from the nurses, doctors, and social workers of her local hospice. Grace has been gathering together personal notes and gifts for various family members and friends. These will be given to family and friends upon her death. Grace and her sister are very close. She has been a welcome source of comfort and strength. Their bond is deep and complex. Grace wants something special to give to her sister. This quilt seems to be ideal as her remembrance. Her sister is a seamstress and appreciates the work that is needed for hand made items like quilts. 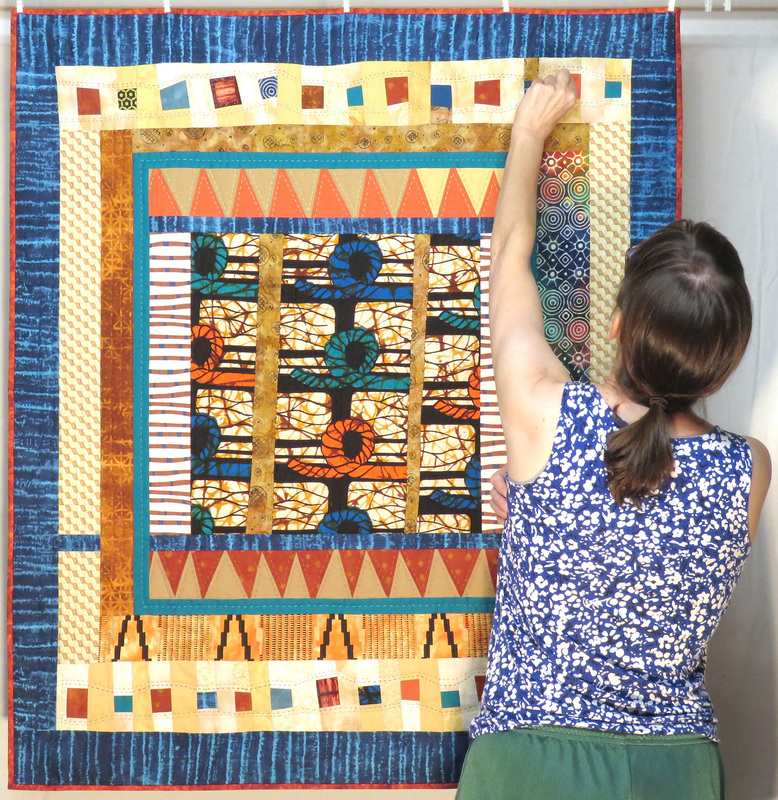 Her sister’s favorite color is orange, a color that stands out in this quilt. Plus, Grace and her sister have had long meaningful talks outside under the stars about many deeply personal things. The stars in the quilt are a reminder of those talks and what they have shared. Grace’s son will act as executor of her Will. He will follow her instructions explaining the source of this quilt and how it came to be given to her sister. It will serve as a lasting memory of their love for each other. Peace to you, Grace. Thank you for your moving and inspiring story. 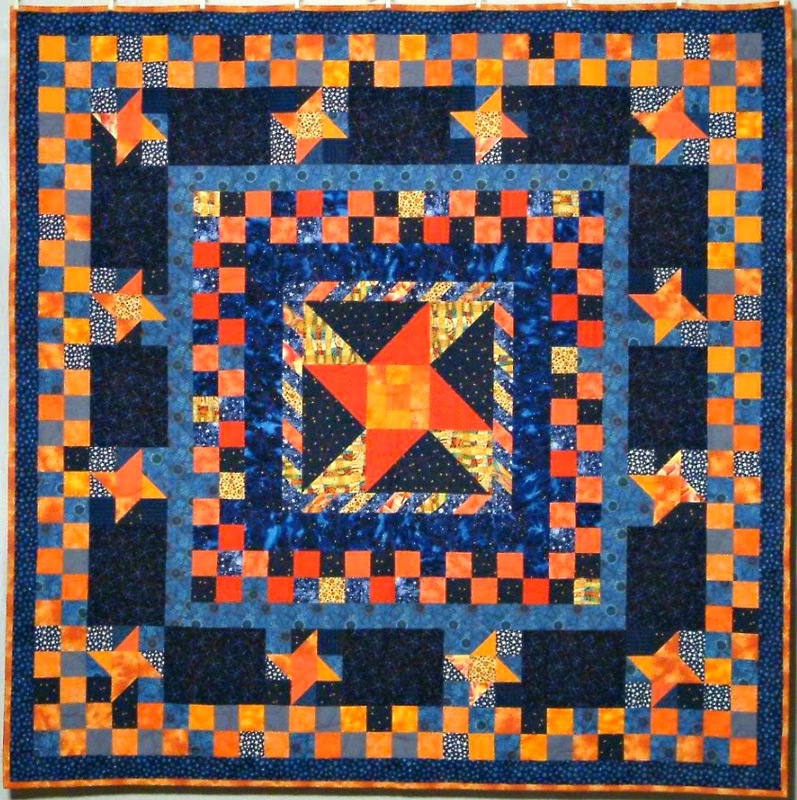 Two years ago, Melanie made the quilt below for a blog project that I especially liked called Oh My Stars. I want to offer it for someone to purchase. The quilt dimensions are 59″x60″ (1.50m x 1.52m). A deserving charitable organization in our community will receive the money. I’ve never done this kind of thing before. We learn by doing. The basic plan is for interested persons to (1) explain why they want the quilt, (2) make a monetary offer, and (3) choose one of the six organizations below as the recipient of their offer. Offers are to be made in private using my email address provided below. Only offers submitted using that email will be considered. Only offers from the U.S. will be considered due to shipping cost constraints. The winner will be asked to write a check to the charitable organization they choose, not to me. Those details will be worked out after the selection of the winning offer. Submission deadline is midnight 1 February 2016. I will review the offers and decide who wins. My choice will depend on the explanation by the person as well as the amount of their offer. No doubt, this could turn into a difficult decision. I hope that is actually the case. Submit offer, explanation, and choice to: Offer has expired. A winner was chosen.